Ethics and business: the main challenge. 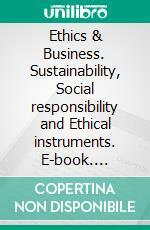 The key issues: sustainability, social responsibility and the ethical instruments. But what are the instruments of ethics? How do we recognize a form of behaviour as ethically correct? What is a social responsible organization? At the European Union level, what are the main directives and guidelines? What about at the international level?